A medical resident at a hospital in Argentina and her team of staff are facing disciplinary action after images of her performing her first c-section were posted online. 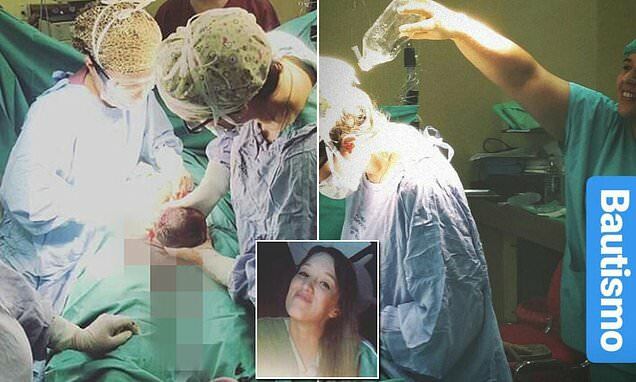 Florencia Espinola, who has been practicing medicine since April 2017, shared a picture on Instagram and Facebook of the moment she extracted the newborn baby at the Evita Pueblo Hospital in Berazategui, Buenos Aires. The images show her securing the child's head in her hands as she pulls her out. But Karina Fiquepron, the director of the hospital, has told Argentinian news outlet Todo Noticias that everyone involved could be subject to an investigation and even a three-day suspension, even though the patient gave the practitioners her consent. 'It should never happen, Fiqureron said on Wednesday. The picture of the birth was split with a smiling image of Espinola as she leaned on a table where a birthday cake with a long candle lit beside her. 'This is how you start a happy birthday,' Espinola wrote on Instagram after accomplishing her medical feat at the Buenos Aires medical facility.